We’re baaaaaack! Thanks for all of the Friday FAQs love last week. It was so exciting to see your enthusiasm for the return of this series. Please keep those questions (and answers) coming! And we’ve got even MORE fun news to share with you…next week will mark the return of another series—Things I’m Loving Lately! I’ve received a lot of requests for this series to be brought back and I’m absolutely thrilled to be rebooting it in 2018. A. Hi Jenny, Thank you! Oh man…I can’t even tell you how many vegan carrot cakes I’ve attempted over the years! I’m so picky and don’t like to share anything I’m not 100% sold on, but I’ll keep working on it. I do have some great carrot cake-inspired recipes you can check out in the meantime though: Whole Grain Carrot Cake Loaf with Lemon Glaze, Vegan Carrot Spice Muffins for Grandpa, Heavenly Carrot Cake Baked Oatmeal, and Itty Bitty Carrot Cake Cookies. Q2. Thanks for helping me discover that vegan cooking can be so easy and delicious. I’m giving this Cumin Lime Black Bean Quinoa Salad a try for lunch this week and can’t help noticing that the lemon-tahini dressing has no lemon in it but instead lime. A. Hey Kim, Thank you so much for the kind words! 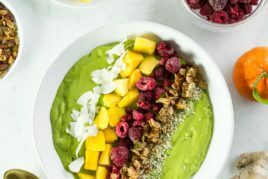 The Lemon-Tahini Dressing listed in the ingredient list is actually supposed to link to the dressing recipe in my Lightened Up Protein Power Goddess Bowl! It’s wonderful drizzled on top of this quinoa salad. 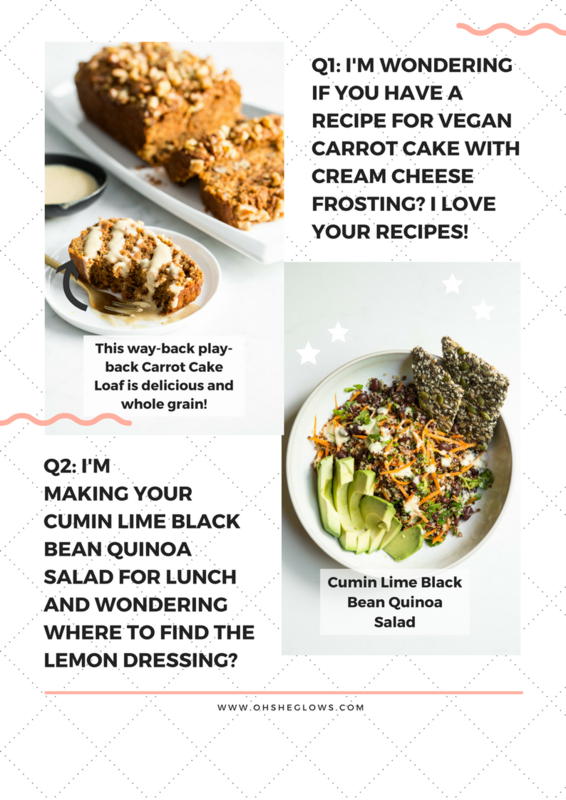 I’ve now added the link to the Cumin Lime Black Bean Quinoa Salad ingredient list so you can access it more easily. Thanks for mentioning it! Q3. Are you still using the Cuisinart Food Processor? I need to buy a new processor and I am sure that you use a good one. A. Hi June, Yes, I’m still using the Cuisinart 14-Cup Food Processor, but sadly I don’t recommend it as mine has broken in two different places after only about a year of use. I don’t know if the brand’s quality has diminished or if I just got a dud! I’d LOVE to hear from fellow blog readers who might have a food processor recommendation for us! Q4. Angela, This Friday FAQs redesign is so fresh and clean—love it! Do you have any tips for substituting oat flour in your gluten-free recipes? Sadly, I can’t even do GF oats due to cross-contamination, and grains are out, too. Thank goodness I love veggies! I bought your first cookbook for all my sis-in-laws and BFF and they bought the app and OSG 2.0. We are all happy OSG households. A. Hey Kathy, Thank you so much for the cookbook and app love!! And for gifting them too. :) I’m so honoured! A few grain-free flours that I stock in my pantry are: almond flour, coconut flour and cassava flour, as well as a variety of starches like arrowroot and tapioca. You might be able to experiment with a combo of those flours/starches in recipes calling for oat flour, but generally it takes some patience to get the right ratios (and it would vary depending on the recipe). I’ve tried using straight-up cassava flour as a 1:1 sub for regular flour in several recipes and I haven’t been pleased with the texture/flavour so far (I’m thinking a combo of grain-free flours may work better, but I’m also super picky with my baked goods!). Is there an oat flour-based recipe you’d like to try first? I’m always up for a little experimentation, so if you have one in mind feel free to chime in and I’ll see what I can do! Q5. Does this Golden Beet Salad with Shallots, Parsley, and Orange Miso Dressing hold up the next day? I was thinking of prepping this the night before for lunch at work. Perhaps just leave the dressing off? A. Hey Alexis, I love your idea of leaving the dressing off. Quinoa tends to be super thirsty and can diminish the orange dressing’s flavour with time, so it’s a good idea to make the dressing separately and add it right before serving! I’d love to hear how it goes. Q6. Yeah…Friday FAQS are back! 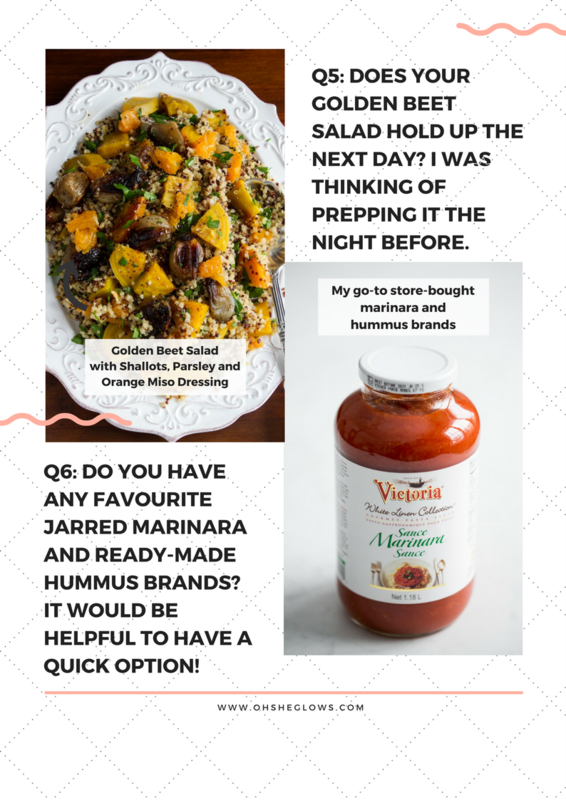 I usually make homemade marinara sauce and hummus, but do you have a favourite jarred marinara and ready-made hummus brand? It would be helpful to have for a quick one-pot weeknight meal! A. Hey Kristen, So glad to hear you’re pumped for the return of Friday FAQs! As for store-bought marinara and hummus, you bet I have a couple go-tos: my fave marinara is the Victoria White Linen Collection Marinara Sauce found at many Costco locations. We’re all obsessed (including my extended family!). I think I have about six in my pantry right now. As for store-bought hummus, I love both Fontaine Sante Organic Classic Hummus and Sunflower Kitchen Classic Hummus+ (both Canadian brands). I mix them together in Adriana’s Fave 10-Minute Pasta recipe and also love the marinara in my Hunky Heartbeet Cabbage Soup—the added flavour is out of this world. Q7. 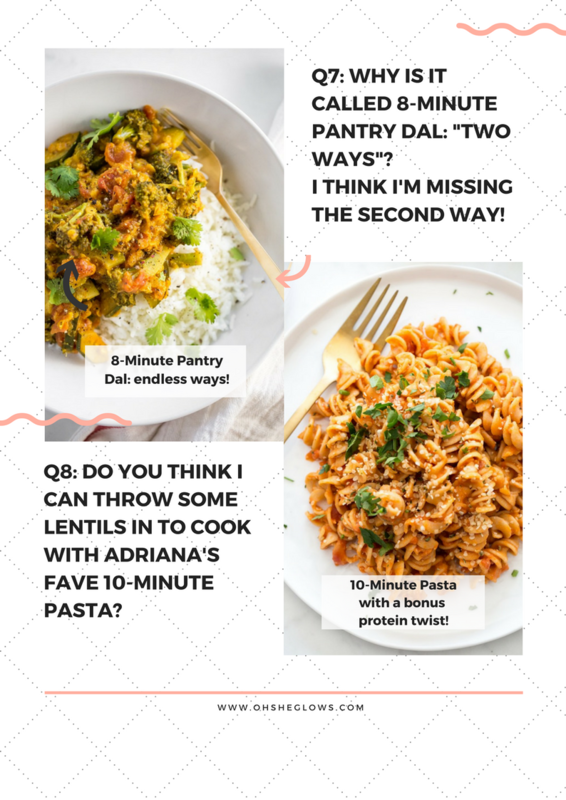 Why is it called 8-Minute Pantry Dal: “Two Ways”? What’s the second way? A. Hey Supriya, Oh good question! The two ways are the two curry powder options that I provide in my recipe tip. If you don’t have a favourite curry powder blend on hand to use (way #1), I suggest a little DIY method for way #2: 1 1/2 teaspoons ground turmeric, 1 1/2 teaspoons ground coriander, 1 teaspoon ground cumin, 1/2 teaspoon ground ginger (or more to taste), and 1/4 teaspoon cayenne pepper (optional). Don’t forget to use the 1 1/2 teaspoons of both garlic powder and minced onion, as well. If you run out of curry powder, this back-up spice mix comes in handy and tastes great. I can’t decide which way is my favourite! Q8. Can I throw in some lentils when I’m cooking Adriana’s Fave 10-Minute Pasta? A. Hey Lindsay, Oh that’s a fun idea! Your suggestion made me so curious that I just had to give it a whirl myself. I mixed my go-to dry Monograno Khorasan-Kamut Fusilli Pasta with uncooked red lentils. I used red lentils because they cook so quickly. Here’s the method I’d recommend: Bring a pot of water to a gentle boil, then stir in the uncooked pasta and red lentils along with a pinch of salt. For my first attempt I used 3 cups uncooked pasta and 3/4 cups uncooked red lentils. Reduce the heat to medium/high and simmer uncovered until the pasta is tender (simply following the package directions). In my test, the red lentils broke down completely—but that ended up being a happy result as one of my kiddos tends to pick out whole lentils in any dish. They weren’t easily discernible once the sauce was mixed, but do produce a thicker overall texture (which I loved!). I did find that I needed to use more sauce since the lentils dried out the pasta a bit. I’d like to experiment with other kinds of lentils in the future, too! Between this and my high-protein red lentil rice option, I’d say it’s pretty easy to boost the protein and fibre in kid-friendly dishes without impacting the overall recipe too much. #winning! Hey Kendra, Aww happy birthday to your little boy! Such a sweet age. I’m so glad he loves the 10-Minute Pasta recipe. I also love to use red lentil or chickpea pasta in that recipe from time to time. And I love your protein-boosting Hunky Heartbeet Cabbage Soup trick! I wouldn’t have thought to try adding lentils in that one, but it’s a great idea. Okay, with all this talk of my Whole-Grain Carrot Cake Loaf, I’m going to have to make it this weekend!! Update: I made the loaf and it was fantastic! I love rediscovering old blog recipes…so glad you mentioned it. Actually, if you pop over to my Insta Stories today you can see a couple behind-the-scenes action shots! PS…I’m revamping this loaf for the recipe app and blog in the coming days, too! I am trying to cut out all refined sugars. The only sweeteners I want to use are raw honey and maple syrup. This is my question. Do you have any recipes for homemade milk chocolates that can be sweetened with honey or maple syrup. Hey Darlene, This chocolate bark is really good and sweetened with maple syrup: http://ohsheglows.com/2015/03/18/crazy-good-coconut-oil-chocolate-bark/ It’s not a “milk” chocolate though. I’ll have to put it on my list! That’s such a bummer to hear your Cuisinart food processor is on the fritz :( Nothing worse than shelling out extra dough on a high-end brand for it to crap out anyway. That’s been my story with blenders (thank goodness for 7 year warranties)! Knock on wood, I’ve been lucky with my food processor, so I will recommend Kitchenaid’s Architect if you’re considering a change. My model is KFPM773. It’s a 12 cup beast (so heavy!) but pretty powerful as a result. We named her Xena! She’s at least 5 years old and has made many a nut-butter and even eaten a spoon… oops! The only wear/damage is a small chip in the canister from me being rough putting the lid on, and some slightly bent teeth on the blade from the spoon incident. It come with various blades that mostly collect dust, a smaller canister that sits in the big one, slicer/grater plates, etc. I hope I don’t jinx her with my raving. Long live Xena! haha!! Love this review Sarah. And that you named her, and that you had a spoon incident (!). I’ll definitely look into it..thanks! OMG…my question made it to Friday FAQS!!!! I am thrilled and honored! Giddy with joy! Thank you for making my day after a hard week! Thank you so much Angela! I am so appreciative of you! And I made Adrianna’s favorite pasta and we loved and inhaled it! My husband saidI quote” I could eat this everyday!” And we loved it as leftovers..delicious! We are teachers and everyone at the lunch table was drooling! Your carrot cake loaf is on the list fo this week, along with your stuffing balls substituted with pecans, and H loves your chocolate chip almond butter cookies! I am salivating and so excited to start cooking! Thank you so very much from the bottom of my heart! I appreciate all of your hard work and dedication! I am a scientist now teacher and your recipes are foolproof! LOOOOVE! I have a Breville Sous Chef food processor and LOVE it! I’ve had mine for about 4 years now and have no complaints! It comes with a large and mini size bowl and has discs for shredding, slicing and French fries. Easy to clean and the motor has a 25 year warranty. I had to contact customer service once for an issue I was having (not related to the machine — it was a mistake I was making!) and they were wonderful to deal with. The only downside it that it is HEAVY and relatively large (won’t fit under kitchen cabinets) but I couldn’t imagine using anything else. Thanks Ceilidh! Can’t wait to check this one out. Doesn’t hepful customer service make all the difference, too? I second the Breville Sous Chef recommendation! I had a Cuisinart for years, and got so sick of the cheap plastic bowl that was cracked in several places. Also, I hated that I’d get a puff of dust escaping anytime I would put flour etc. in the bowl. The Breville has a genius seal that doesn’t let anything escape. It’s way more powerful than the Cuisinart. I can make nut butter or nice cream in literally half the time. Also, I have the biggest capacity one, and it does fit under my upper cabinets, so I think it just depends on your kitchen. Highly recommend! I’d reccomend a KitchenAid food processor. I have a 9 cup one (now discontinued :( ) that I love and use at least twice a week, I’ve had it for 3 years. But I wouldn’t recommend the 6 cup one, my mom has it and it feels cheap, probably because the “lock” for the handle is a pressure button on the front, instead of having it lock in to place. Hey Harlyn, Thanks so much for the rec! I’ve heard good things about the KA processors. 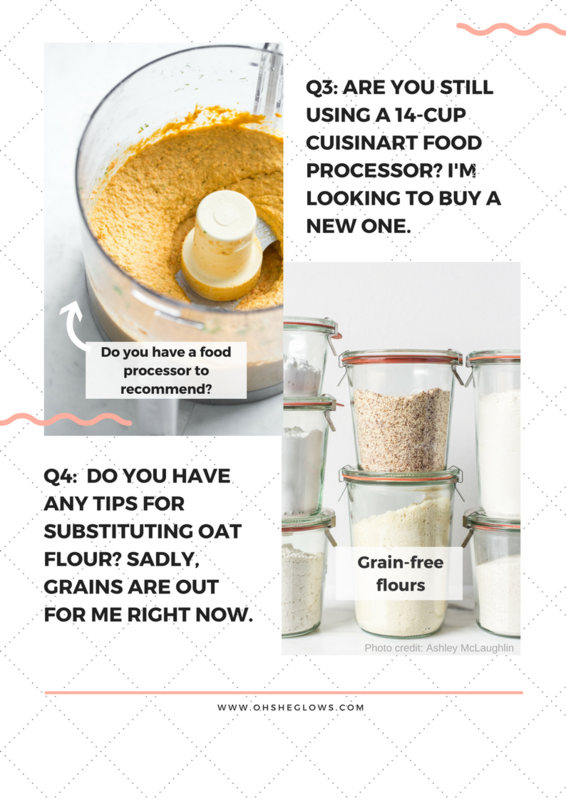 💕💕 Thank you for answering my question about grain-free flours! What a happy surprise to see it in print. I used to eat the Out-the-Door Power Chia Doughnuts from OSG 1.0 like crazy and the Zucchni-Walnut-lentil loaf (from the blog). My hope is to make something in cupcake, mini-cupcake or mini loaf pans that the hubby and I can pop out of the freezer for lunches, hikes, working out or a quick breakfast, but I struggle to make something that isn’t gummy, super-dry or granular. Coconut flour seems to soak up liquid, and Cassava is grainy in higher amounts, Thanks for considering! I am needing help with toddler snack ideas. My daughter is 14 months and doesnt have many teeth. She loves banana bread and almond butter, she’ll also drink smoothies, but she’s become picky with veggies. Any suggestions? The above are all great make ahead options where you can make the full recipe and freeze or refrigerate for many snacks. A quick idea is to top banana rounds, sliced thinly, with a drop of almond butter and some shredded coconut. As baby ages and can chew more, mom can take advantage of the kid-friendly label in OSG Every Day and the kid-friendly filter in the app. A special thanks to OSG’s recipe tester, Nicole, for all the great idea (she runs a daycare and makes these all the time for her kids). Hi. I bought a Hamilton Beach food processor from Canadian Tire probably about 7 years ago and I am so happy with it! Its one of the cheapest brands you can get so my expectations were very low but I wouldn’t hesitate to buy another one. Seconding hamilton beach. My first food processor was from them – cost maybe $25 and lasted me 5 years and oodles of recipes! I’ve had my 12 cup Cuisinart for over 35 years and it’s still working! I would love a new bowl for it but somehow I think that I might be out of luck. Wow, that’s amazing Irene!! They don’t make ’em like they used to. ;) I know so many people who have their “original” machines from years ago and they still work great. Hold onto that beauty! hehe. I’ve been happy with my 7-cup Cuisinart over the last five years and expect it to last a good long time. I’ve never felt the need for anything larger. My mom has an earlier similar model that’s decades older and still running strong. I’d thought I would chime in with my two cents for the food processor. I have the ulta deluxe 14 cup Cuisinart Food Processor (with all the little “mini” sizes that fit in the big size) Unlike Angela I do not have any problems with it. That being said I am sure I do not use it nearly as much as she does, I mean she is a super profesh food blogger. I don’t make nut butters or bread with it, which I know can burn out the motor fast. I also never tried the smaller attachment bowls. I know that my Mother still has her old cuisinart which might be 20 years old? But the new ones at least don’t leak out juices, which is nice. I like my cuisinart but I was hesitant to get one because I heard many people say they aren’t what the use to be, but I think maybe Angela got a dud. My go-to recipe for carrot cake is the loaf cake from Smitten Kitchen–I’m not usually vegan, but this recipe is so amazing it easily beats any non-vegan recipes I’ve found! I usually make it healthier by swapping in half or all whole wheat flour (I bet it would hold up well with spelt, too) and substituting maple syrup for some of the brown sugar. Then I can justify eating it for breakfast :D I bet it would be great with the cream cheese icing that Kendra recommends! Oops…just remembered that recipe totally has eggs in it. I have successfully made this recipe with flax seed eggs, though! Oh, thats great to know…thanks! Ps. Love the app- just bought it on sale and it is gorgeous. Hey Nicole, I feel your pain…it’s not easy to come up with new ideas. I’m really loving the red lentil trick (cooking it with pasta), so far my kids haven’t noticed any different, and it’s such a great way to boost the protein effortlessly in typical carb-y meals. We also do a lot of stew/soup, flax wraps (with homemade hummus, avocado, tomatoes, hemp hearts, etc), sweet potato fries and veggie burger bites, etc. I love these Friday FAQs Angela, so glad you brought them back! I have the same food processor as you and so far I’ve loved mine, wondering if you just got a dud. Thanks Mallory! Yes, I’m thinking I got a dud too…it’s an otherwise fantastic machine. I love the look of it, and it processes great. Hey Dale, It can have a couple different names from what I’ve seen. It’s most frequently called “all-purpose spelt flour” or sometimes “light spelt flour”. Yes I think you can buy it online from various places, but I’m not sure where the best deal is from. Hope this helps! And in case you’re thinking of making the carrot cake loaf, it works wonderfully with whole-grain spelt flour (a bit easier to find). Another option if you’re in a pinch is to sift the whole-grain spelt flour yourself with a sifter. I am a long time fan and have made it my mission in life to sample all of your recipes. Hey Brittani, Aww that’s such a fun goal! Thank you :) I have 3-4 pancake recipes on the blog, but you are right I haven’t posted any recently. The ones I used to make the most are my buckwheat ones: http://ohsheglows.com/2012/03/08/vegan-gluten-free-vanilla-blueberry-buckwheat-pancakes/ although it’s important to use a non-stick skillet for those. This is a spin-off of those I believe: http://ohsheglows.com/2014/02/25/easy-vegan-and-gluten-free-pancakes-strawberry-shortcake-w-whipped-cream/ I also have healthy spelt pancakes for one: http://ohsheglows.com/2010/01/02/healthy-spelt-pancakes-for-one/ and PB swirl whole wheat pancakes: http://ohsheglows.com/2009/08/05/healthy-peanut-butter-coconut-swirl-pancakes/ I’d love to hear if you try anything out! Hi! I just made Adrianna’s 10 Minute Pasta with red lentils tonight, and I am currently having seconds! I used about 5 C. of bow-tie pasta and 1/2 C. red lentils. I used a whole jar (about 2.5 C.) marinara sauce. It turned out great and I’m pretty sure I will use this way of cooking this recipe each time since it was so easy to just add the lentils into the boiling water with the pasta! My husband and tots (ages 4 and 2) finished their plates as well. Thanks for the idea! Now on to my third dinner… a glass of wine! Angela! I finally got around to reading this post and was so thrilled to be the comment of the week! I’ve been plant-based for about 5 years and my husband for almost 20, and you are one of the few recipe sources we trust implicitly to taste delicious every time! By the way, I tried your rice and lentil trick and it was great! I’m thinking lentil rice will be the norm in our house from now on. Oh, and I’m definitely going to try some of your great suggestions for Christal. 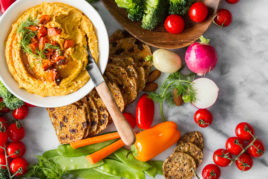 Putting cooked veggies in hummus is such a great idea and I’m excited to try your carrot hummus recipe! Lately my little one has been loving your Blisful Blueberry Banana Spelt Muffins. I just omit the nuts and cane sugar when I’m making them for him and they are a perfect breakfast or snack. Hey Kendra, I’m so glad you saw your comment featured! Thank you again for the kind words. I also love that you make the blueberry muffins like I do for the kids (without the sugar/nuts…the banana sweetens them just enough, but sometimes I’ll add a bit of maple syrup if my bananas aren’t overly ripe). I love your Friday FAQs, cause they’re usually about something that I wanted to ask, too. Thank you for sharing your thoughts! 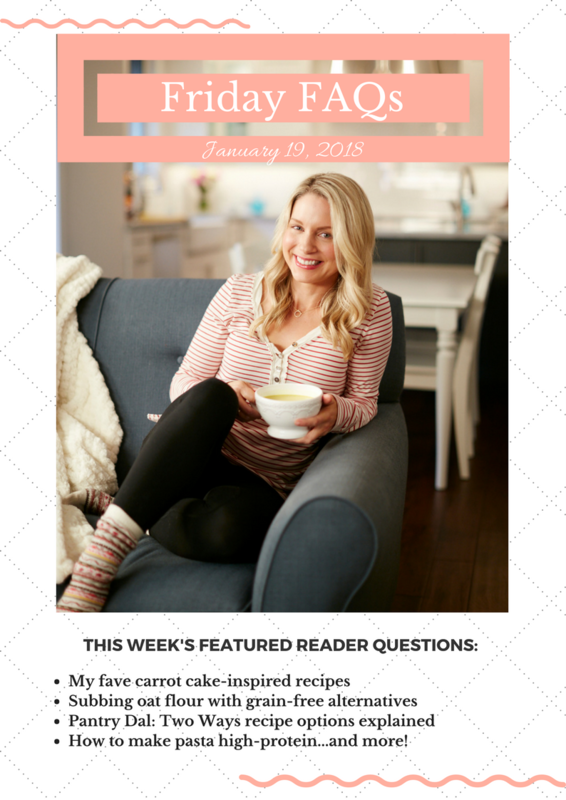 Love your blog and cookbooks! I have a nonfood question…I love that striped top.can you share where you got? Thanks Dee! It’s from Anthropologie a few years ago. I want to say thanks for your recipes. Hi Angela. My family has been asking for carrot cake, which is helpful to me because I love to make carrot juice with my Green-Star juicer (see https://www.juicerville.ca/collections/green-star-twin-gear-cold-press-juicers/products/green-star-juicer-1000?variant=245122190) and I don’t like to throw away the pulp. I read that you have been working on a healthy, nutrition-based vegan recipe for this (hopefully with decadent vegan cream-cheese icing) and hope that such an Oh She Glows recipe will be available soon. I love the Green-Star juicer, and it is wonderful to get two items out of the process: a healthy juice and baked goodies! Thank you for all your wonderful recipes and for your continued sharing of all your insightful nutritional insights. Your recipes are my favourites! Next post: Things I’m Loving Lately: 2018 Reboot!